Editor’s Note: This is a reblog of the Civic Beat co-founder An Xiao Mina’s post on Ethnography Matters. After my talk, a few Ugandans came up to me to talk more about memes. I took the opportunity to show them cheezburger.com, the mega popular lolcats site. I’d taken as a basic truth that cats rule the internet, a rule enshrined in Ethan Zuckerman’s Cute Cat Theory of Digital Activism. One of the main premises of his theory is that Web 2.0 tools are designed for sharing pictures of cute cats. By cute cat, of course, he means any prosaic activity on the web, but his choice of the cat to symbolize this is reflective of the enormous influence of felines in vernacular internet culture. And yet, when I showed some of my favorite lolcats to internet savvy youth in Uganda, they didn’t giggle in the same way I’d seen Chinese and Philippine users giggle. The idea was funny, to be sure, and they liked the idea. Long cat, grumpy cat, ceiling cat–what I’d understood to be the canon of internet culture simply didn’t translate. So what did these urban, internet-savvy youth find funny? 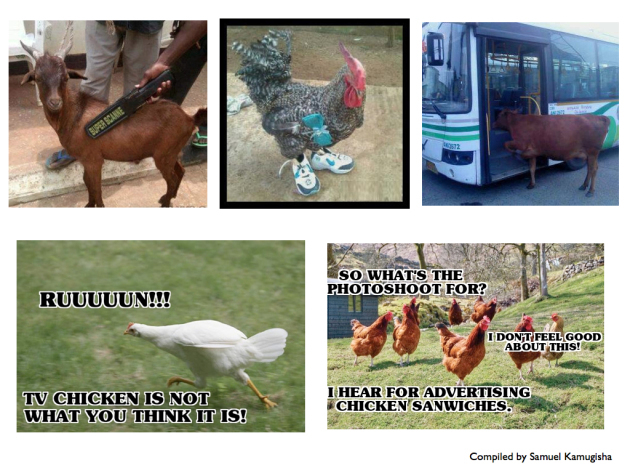 One individual, Samuel Kamugisha, sent me some of his favorite funny pictures from the the Ugandan internet. A large number of them contained the very animals I’d seen everyday on the streets: chickens and goats. Chickens wearing shoes. Chickens wearing sunglasses. A goat getting swabbed by a metal wand. Not all of these images originated per se from the Ugandan internet, but they certainly circulated amongst Ugandans as funny images. After spending nearly three months now in Uganda, I’m realizing something anyone who’s spent time on the internet can understand. Humans love animals. We’ve connected our culture to animals since time immemorial, starting with the prehistoric animal animations in Lascaux and moving forward to the animals of the Zodiac. We’ve always had a fascination with the living creatures around us; but which living creatures roam around us has different in different times and cultural contexts. The internet is no different. And just as the animals of the Western and much of the Asian internets tend to reflect their lifestyles—keeping cats as pets–, so does Uganda’s internet. Ugandans don’t keep cats as pets, and many have told me they’re scared of cats. Indeed, I only see cats in dark corners. They’re more like pests than pets. And yet, the form of internet culture has been very similar in the contexts I’ve observed. The details, on the other hand, are incredibly local. Even the animals we choose to develop our internet humor around are very much culturally-situated. Each of these jokes expresses a social and political reality that urban, internet-savvy Ugandans regularly deal with, from infrastructural challenges to government corruption to the seemingly-endless rule of a President “elected” for four terms now. The form of a hashtag joke is universal to anyone using Twitter, but the specifics of these jokes often only make sense when you understand Uganda. Of course, there’s nothing new per se about humor to talk about social issues. We can look to the role of the jester in ancient societies to understand the critical role of humor in speaking truths that remain otherwise unspoken or covered up. But, as in many fields of life, the internet has enabled more people to become jesters, and for the jesting to be networked. As Ugandan writer Ernest Bazanye explained to me, this was one of the first mass hashtag jokes to hit the Ugandan internet. With an emerging internet population of some 4 million (in a country of 35 million), we’re already seeing an emergent culture of networked activity and humor. Did #PLE2012 accomplish anything? It depends on what you’re looking for. The hashtag joke came and went, as did jokes about President Museveni’s new Benz, and a punning Facebook group about the regular failures of Umeme (pronounce “ooh-meh-meh”, not “You-meme”, though the pun is tempting), the monopolist power company, to provide consistent electricity. On the other hand, you can’t fake memetic spread and humor–something either goes viral or it doesn’t, and it often goes viral because it’s connected quick closely to something that people online are thinking about already. Our session was called Stories, Insight, Action!, and as I discussed this with Tricia one night, I realized that the action is another story. But this story is a bridge story, a point of discussion about contemporary issues. Just as the Daily Show has become a primary source of news for many due to its mix of laugh out loud jokes with serious issues, so do social and political memes often provide a social lubricant around difficult civic issues. There’s not yet a Daily Show for citizen media, but as the world comes online, internet humor and its norms are mixing with the very social and political issues people care deeply about. Image via Urban Legend Kampala. Now, I wouldn’t call this a meme proper. The goat jokes haven’t gone viral in quite the same way as #PLE2012 did, and I counted only a handful of participants. But it certainly got my attention, and maybe yours too, too. Just as the Grass Mud Horse in China, animals serve as an amazing vehicle for political commentary and humor online. And while we’re learning about goat jokes online (the other notorious goat-related internet phenomenon aside), maybe there’s a new vehicle in there for storytelling. Talking about a Photoshop hack and the missing goats is a way to introduce issues around governance in Uganda and the continued importance of livestock in people’s livelihoods. As I’ve been driving around northern Uganda this week, I’ve seen so many people laughing and giggling. In the wake of #KONY2012, a meme about northern Uganda but not driven by Ugandans, the popular Western image of Uganda is not one of laughter and giggling. But there’s a lot of laughter and joy around the country. Sometimes that’s laughing at a chicken or pig scampering across the street, and sometimes that’s laughing sarcastically at some of the absurdities of the political and infrastructural challenges of daily life. As the late Chinua Achebe said in an interview with The Atlantic, “And this is really what I personally wish this century to see—a balance of stories where every people will be able to contribute to a definition of themselves, where we are not victims of other people’s accounts.” He wrote about this in the context of literature and writing, of course, and as media industries grow across Africa, we’ll see more films, music and other media produced by Africans from their own perspective. Indeed, Mark Kaigwa pointed out in his talk that in so much of the developing world, and Africa in particular, Western media tend to use imagery of misery and suffering on the one hand and wild animals on the other. There’s rarely a middle ground. And I’m fascinated by the potential for humor in general—like chicken and goat jokes—to break that narrative. I’m also starting to wonder if pointed political humor can serve as a way to open up a discussion about serious issues without resorting to the usual tropes to talk about global contexts. Could internet culture be a bridge culture, much like hip hop and Hollywood films have done so successfully? Everywhere I travel, people know Michael Jackson and Arnold Schwarzenegger. These cultural references are driven by large companies, but internet culture is more bottom-up. It’s at once universal and at once highly local. Ugandans don’t have lolcats, and they don’t have lolchickens. Ugandan internet lingo doesn’t use the word “lol”; they have their own laughter words online like “*dead” (for dying of laughter). But we in the West can still relate to and understand Ugandan internet humor, just as they can understand Western cat memes. As more and more people join the internetz, we often talk about opportunities for politics, commerce, education and exchange of information. But I also think we shouldn’t forget about why most people come online in the first place–to chat with friends and share funny pictures. The internet is a highly cultural and creative space. Though prosaic on the surface, what we chat about and what we share will be quite different around the world. And perhaps that too is a vehicle for telling stories. Dubbing memes the "street art of the internet", An's current research looks at the growing role of internet culture and humor in addressing social and political issues in countries like China, Uganda and the United States. She travels a lot and thinks chickens are pretty funny.